The press release bills this book as a love story, I disagree, it is a story about love. Specifically one man’s search for an everlasting love. We meet Wayne Cavanaugh as a sophmore attending the rather blue collar Drexel College where he is studying engineering. Through flashbacks author Rob Costelloe explores Wayne’s young life and his fascination with the concept of love. More specifically his quest to take love to a higher plane, an aesthetic that few people can appreciate, let alone achieve. In a chance encounter following a purse snatching Wayne meets pretty Penn State junior Nancy Hammond. This launches Wayne off on his odyssey to find that elusive perfect love. Although he is convinced that Nancy is the one, and Nancy certainly reciprocates the feelings, they have many hurdles to cross, not least of which is the disparity in their social backgrounds. Nancy comes from a rich and influential family, while Wayne is from a very working class one. Of course this problem matters little to the young lovers, however their families and to a certain extent their friends are a whole different situation. Some view Wayne as an opportunist while others are less kind and lean towards thinking him a gold digger. With grit and determination the couple weather the storms and as time passes most of the protagonists grudgingly accept the pair and their love for each other. The families though remain at loggerheads with their children. One thing that popped into my head while reading Coinage Of Commitment was had the roles been reversed with him being from an affluent family and her the poor country girl the relationship would have been viewed as charming, how strange our society is. We have become conditioned to a set of rules, or mores, and when we stray outside the boundaries the walls come up. It is interesting to watch as this couple matures, Nancy gradually working on elevating Wayne’s social status, and Wayne while not openly resisting makes attempts, if not to actually stem the tide of change, at least slow it’s relentless progress. The question is, is this perfect love, and can it last a lifetime? To discover the answer you will have to read the book. Rob Costelloe has created a very thought provoking book that plays on many levels. Part love story, part social commentary, and part exploration of one mans quest for perfection. The standard of the writing is of the highest quality. He states in his biography that he has been writing since he was 8 years old, and that does not surprise me, he is a skilled and splendid wordsmith. The ending of the book comes with a very strange twist in the tale, and one that will surprise the reader. 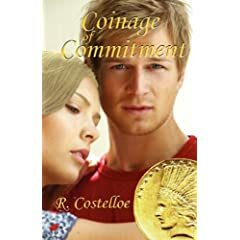 You can get your copy of Coinage Of Commitment from Amazon. No user commented in " Book Review: Coinage Of Commitment by Rob Costelloe "